I usually spend at least one day a week in Bloomington, IN on IU's campus as part of my research (science, not beer) stuff. When I'm down I try to make the most of it by stopping in to the local breweries and bottle shops. In fact I probably buy the majority of my packaged beer in Bloomington because the selection in my part of Indy is awful. 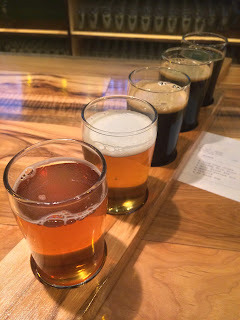 I'm a fan of Bloomington Brewing Co and sometimes Upland, but when I heard that there was a new brewery slated to open I got very excited... based on my visit there, so was everyone else. 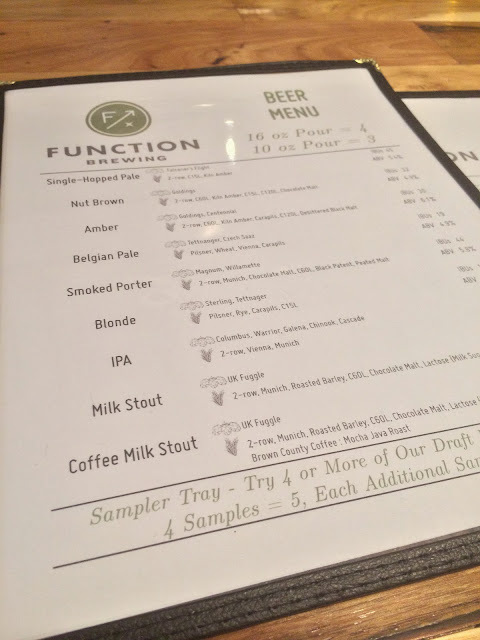 The brewery in question is Function Brewing. 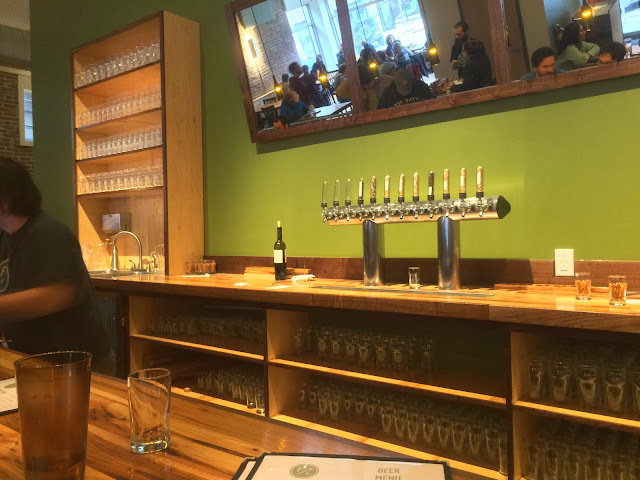 Husband and wife team Steve (brewer) and Arlyn (chef and front-of-house manager) recently opened their taproom just off the square in Bloomington within the last month. Function has the goal of having a core line-up on draft, while continually offering something new alongside those regulars. The name of the brewery and the idea of constantly having "something new" jive well when put in the context of math and science. Consider your ingredients as input, brewing as the Function, and the beer as output. New variables, same function, new beer... zzzZzzz... Simply put they want to play with a variety of ingredients and recipes with the hopes of making different tasty beers. Stay with me here, I'm actually going to talk about my experience there a couple weeks ago on a Friday night... their first Friday night open (keep this in mind). Appearance wise I dug the place; it has this modern and rustic combo: lots of bright greens mixed with black, sleek furniture and fixtures, but lots of wood and brick mixed in too. 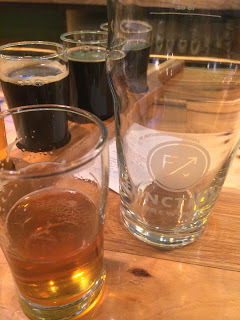 I ordered myself a flight of 5 beers: A single hopped (Falconer's flight; there's that variable!) pale ale, the IPA, a smoked porter, a milk stout, and a coffee milk stout (another variable!). They offer the standard 16oz pour, but also a 10oz pour, which I think is an excellent idea and should be done more often. The beers themselves ranged from excellent (single hopped pale ale), to forgettable (the IPA), to solid (the other 3). My biggest issue was service. I sat 10 minutes at the bar before I was even acknowledged, people were lined up out the door waiting to be greeted (a few left), servers were stressed (but still nice), and waiting for my beers and check were lengthy endeavors. Again this was their first Friday night open so I'll give them a mulligan with the hopes that those issues will be ironed out. They've had some other hiccups since opening, but again a lot of these issues are a function of being a brand new taproom. 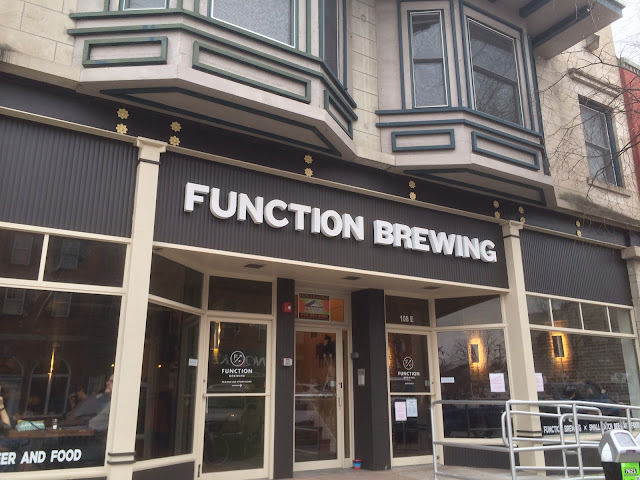 One other thing of note- Function doesn't do carry out (i.e growler fills) yet as they can barely keep up with the on-premise demand. The bottom line is that I think they're worth visiting if you're in the area. Their beers are good with the potential to be great... and they have some interesting offerings when compared to the other places in town. I will say that you should keep in mind the variable of time when visiting them until they can get their feet under them.